We leave Japan for Cambodia in three days. Our five plus weeks here have flown and we’ve found our family travel rhythm. Before a philosophical post on what Japan has meant to us, we owe you a trip report for Kyoto, Kanazawa, Takayama and Tsumago. So I am in catch up mode…first, Kyoto. Again, this is simply a quick list of what we did, where we stayed, yadda, yadda, yadda…vs well worded writing. 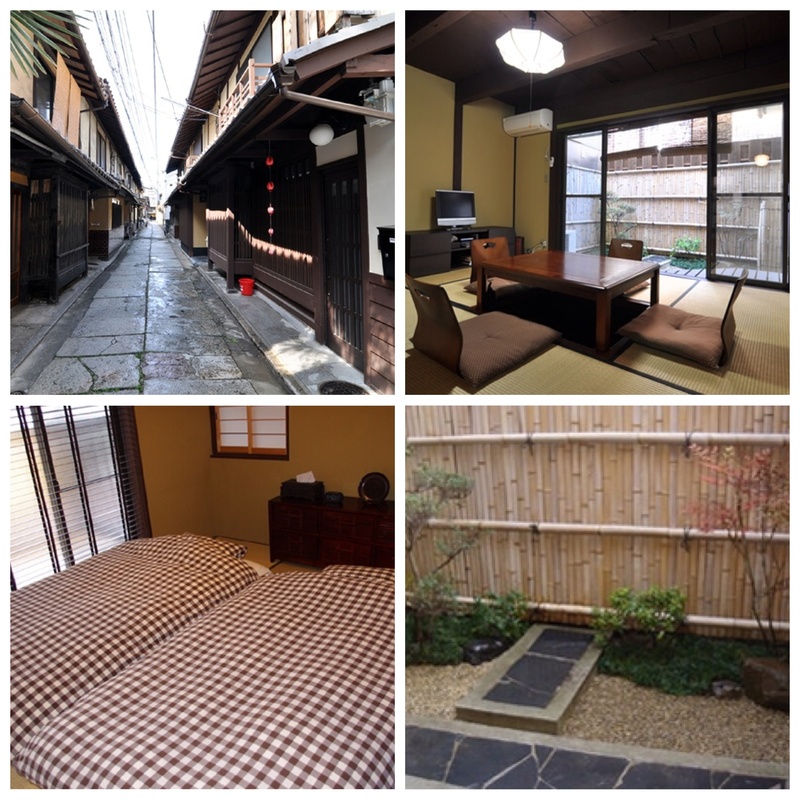 This was one of two decadent stays in Japan…we booked a traditional Machiya home for two weeks. We felt lucky to live in this historic alleyway, hearing the coming and goings of neighbors (we sure know they heard us!). A real treasure and one of our favorite accommodations in Japan. I did an earlier post on this so I won’t go into detail here however we so loved this small town bordering Kyoto…quiet unique temples, bamboo forests and an entertaining monkey park…what else do you need? Kiyomizudura Temple: This decadent temple comes with a pagoda, walking paths, and a fancy-pants water purification fountain. While extremely busy with tourists, it was stunning and the neighborhood it sits in also beautiful. Fushimi Inari Shrine: Over 1,000 orange Torii gates follow a meandering walking path up into the mountains. Stunning. Calming. Sacred. Sanjusangendo Temple: The hall of this temple houses 1,000 life-sized armed Kannon statues. It is an amazing sight to behold. The detail in each Kannon is unique. You are not allowed to take pictures inside the hall so the photo below is swiped from google images. Heian Shrine: We really appreciated the large garden attached to this shrine. We meandered for over a hour, taking time to feed the koi and snapping turtles in the most picturesque place. Adashino Nenbutsuji Temple: Our 2nd most favorite temple…it had hundreds of stone statues amid bamboo trees and was heavenly quiet and sweet. Otagi Nenbutsuji Temple: Our favorite! Thousands of Buddhist disciple statues carved in stone hugging a hillside. Serious, humorous, loving…every face imaginable. Think of complete solitude and hours to explore every face before you. Such joy. International Manga Museum: While most exhibits are in Japanese, there is a collection of English Manga and a great space to read, which gave the kids hours of entertainment. Nijo Castle: Beautiful grounds, intricate details and a moat…what else does one need? 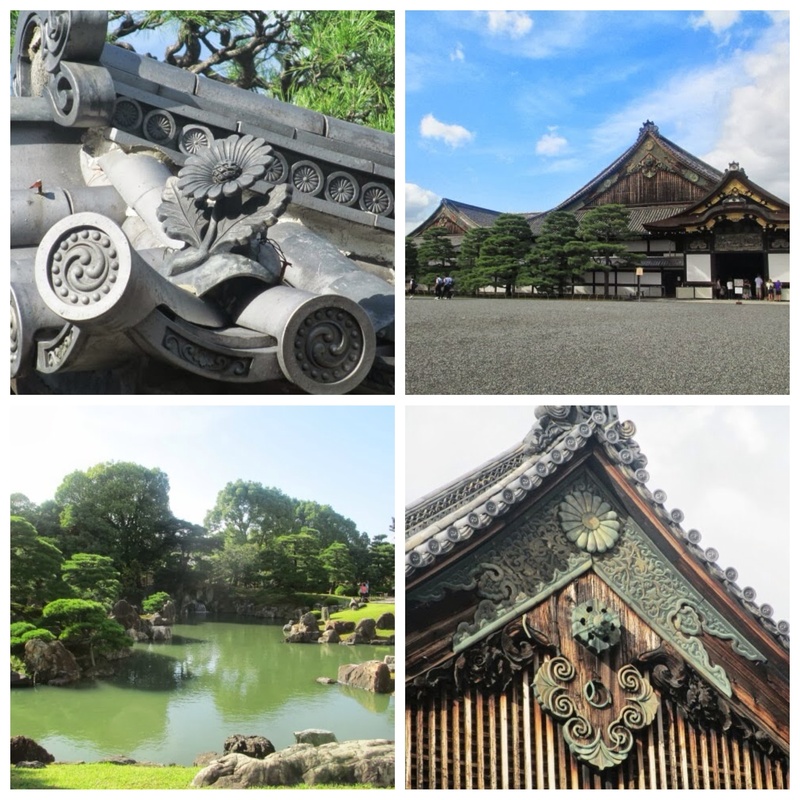 The photos below are of Nijo…loved this place! Sake Museum: Kyle spent an afternoon learning the nuances of Japan’s adult beverage. The tour came with samples…of course. Harvest Moon Festival: We were lucky to be in Kyoto during the harvest moon (mid-September). A handful of temples held evening celebrations with traditional music, dance and food. We partook in all of the above! Handicraft Center: I highly recommend this place if you have kids or enjoy learning local art. They offer approx. eight handicrafts for a nominal fee. Kyle and I tried our hand at wood block art, Sean made a paper toy top and Julia made a glass necklace…very fun afternoon! Kimono Fashion Show: Ok, my family thought this was cheesy but I loved the Textile Center’s kimono fashion show. It runs multiple times a day. I had a smile in my face the whole time but admittedly I am fabric obsessed. Ipuddo Ramen: In the Nishiki market..let me just say this…any restaurant who provides patrons with their own garlic press is A-OK in my book. 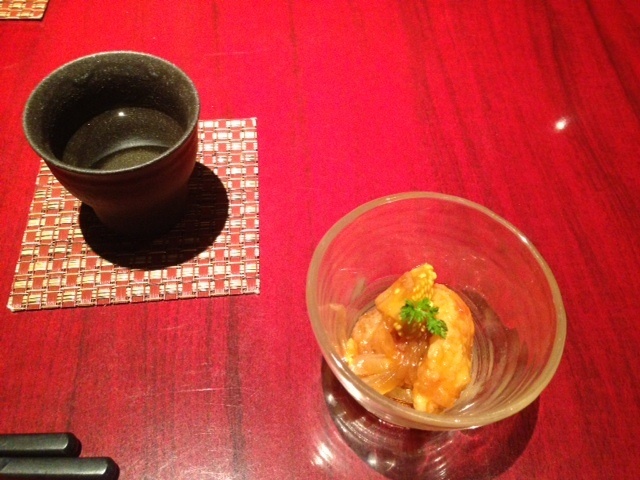 Tsukihi: This central Kyoto restaurant was in our neighborhood and we stumbled in on a date night. No one spoke English but they were very welcoming. I managed to communicate that our server should chose on our behalf. Right choice! In hindsight, we figured out that the restaurant specialized in farm fresh food. We were sorely lacking vegetables in our Japanese diet thus far and we spent the evening moaning in delight at the taste of fresh vegetables and fish. Highly recommended! Gion: Oh, Gion, what have we done to you? You were supposed to be a picturesque, quaint vision of old Kyoto with the stolen sight of a geisha here and there. But I could hardly see you through the hordes of tourists — we’re sorry to have contributed to your chaos. Nishiki Market: When a shopkeeper has to post signs in English asking one to NOT take photos of unique vegetables or fish, the magic is gone. Another sweet spot overrun by tourists (and yes, I’m aware of the irony here). Activity Bookings: Kyoto is a popular tourism city. We found we should have booked activities well in advance. For example, we wanted to take a cooking class and they were all reserved. Also, many sites require a phone call reservation, which can be difficult if you don’t speak Japanese…planning that well in advance assures both room and support. Volunteer Tours: There are a handful of organizations that provide complimentary tours in Kyoto. We used Samaritan Students, which are local university students, and it was a highlight of our trip. This is a must. It’s so easy as a traveler to superficially interact with the locals. Tours like this allow for deeper conversation which was very rewarding. It is normal to pay for transportation, temple fees and lunch for the guide. Run to the Border: Kyoto was surprisingly big and the center was very commercialized. 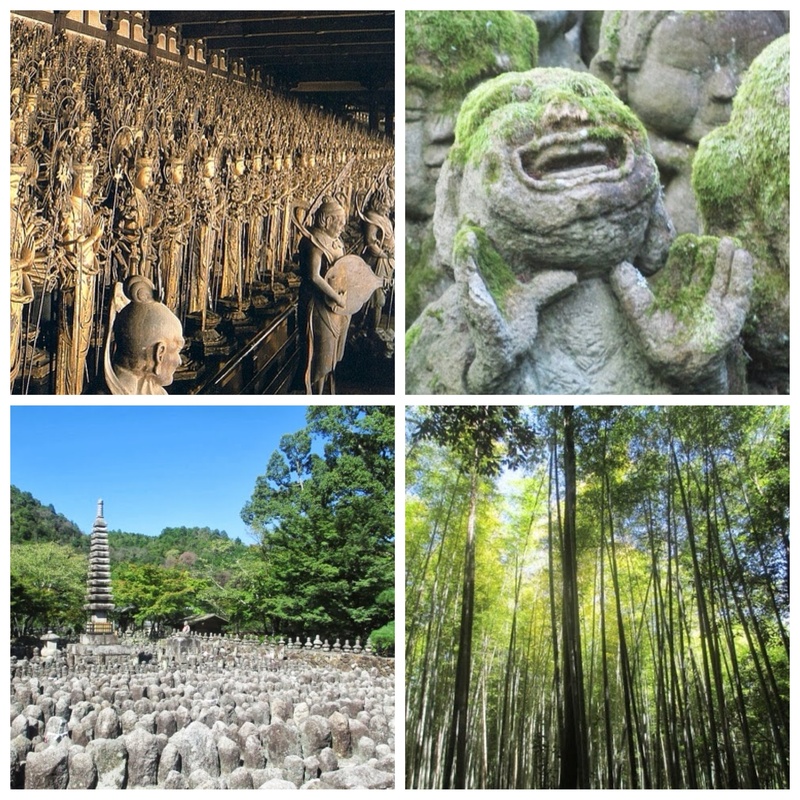 The Kyoto you hear about…quaint, green, calm is found at the edges of the town…Arashiyama in the northwest, Kibune in the north, Fushimi in the south, and so on. Stay tuned for trip reports on Kanazawa, Tsumago and our absolute favorite place in Japan thus far, Takayama (it’s even fun to say)! You bring it all back for me! I lived there years ago and still remember being unimpressed with Gion. It wasn’t as crowded probably as it is now but still felt like a tourist trap. So sad, right? I know my family is part of the problem too…we try to tread light but fail come days! me too – bringing back my Japan memories – I don’t know if you have time to hit the southern part of Japan – Beppu or the north Hokkaido, but both were my favorite regions. Janine, we so wanted to make it south and north. It’s the only drawback of slow travel, not getting everywhere! We have loved Japan but budgeted only five weeks here (pricey place!). When we come back, I now know to ask you for tips! P.S. Hope the girls school transition is going well. Looks like they have the prettiest commute! Janine, we’ll have to compare notes when I get back! We loved Japan and I can definitely see going back to see places more far afield.